Badges and Memorabilia - Brighton technical school, Victoria, Australia. 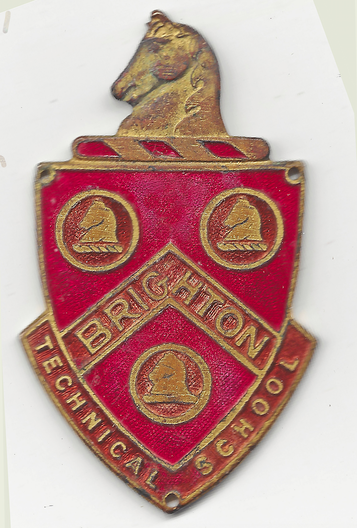 Brighton Technical School Badge - No. 000877. On the 19th. March, 2018, Shirley Joy, the owner of the Brighton Technical School web site, received an email, via the site, from Danny Last, who lives in New South Wales. Danny said that he was sorting through his late father’s possessions and found a Brighton Technical School badge, No. OOO877. During his working life, Danny’s father, Tom Last, worked in Sydney and was employed by Newton Scrap Metal at Marrickville. Danny does not know the history of the badge but assumed that his father who worked for Newton Scrap Metal in the 1990s. and 2000s. found the badge during his routine work. Danny wishes to find the owner of BTS badge No. 000877 and return the badge to its owner. Does anyone have any knowledge of the ‘Last’ family, or information relevant to BTS badge No. 000877? Please contact me via the 'Contact Tab' on this web site, if you do. Photographs of the badge are above. ​"The Argus" 19 April, 1934. Page 8. "School Badges Have a Meaning". BRIGHTON TECHNICAL. The crest of the Brighton Technical School is unusual as it is that of the Snowball family. It is a horse's head on a plate sable. The original escutcheon contained three silhouetted heads against the plates. Authority was granted for the use of the family crest as the school badge to commemorate the valuable service given by the late Mr. O. R. Snowball, former M.L.A., when the school was founded and his work as president for several years. The design was slightly amended by the introduction of the chevron, which enabled the words Brighton Technical to be introduced. The crest is used by Cora Lynn Girls' School, the boys' branch, and the senior departments of the school. There is no motto.